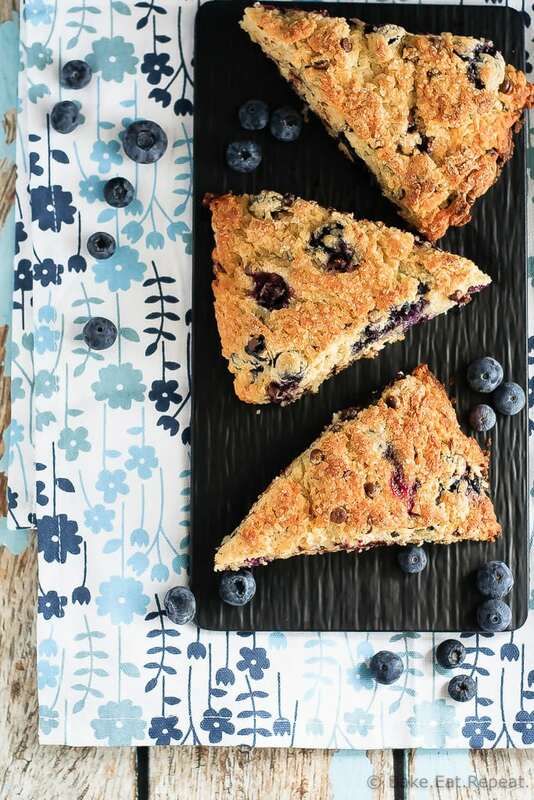 Blueberry Chocolate Chip Scones - Bake.Eat.Repeat. 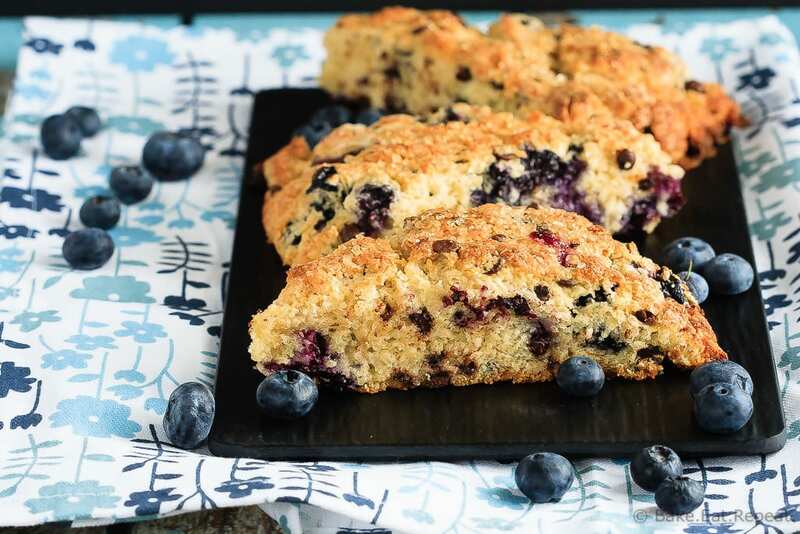 Easy to make, light and fluffy blueberry chocolate chip scones sprinkled with coarse sugar – the perfect breakfast treat! Are you a scone lover or hater? I feel like generally people are one or the other. I love them. Love, love, love. One of my favourite things to have for breakfast. Cause I’m super healthy like that with the most important meal of the day! I wish there was a way to have a really good scone that is also healthy, but so far the only thing I’ve come up with is using whole wheat flour instead of all purpose. Makes it a bit healthier and still really tasty, but I just don’t think there’s any really good substitution for the butter. If you know of one please let me know so that I can have scones every single day. But for now, the occasional indulgence will have to do. These blueberry chocolate chip scones are amazing. I believe that even if you’re one of those crazy people that hates scones, you will love them. I even have proof. The first time I made these particular scones I brought them over to my sister’s place and she said she didn’t like scones. She then asked for the recipe. They’re that good. Really though, I think that most people that don’t like scones have just never had a good one. They shouldn’t be dry and crumbly and impossible to eat without a giant cup of coffee (although I do like to have one of those anyways!). Scones are supposed to be flaky and buttery and amazing. These blueberry chocolate chip scones are that kind of scone. The perfect breakfast treat to have with your giant cup of morning coffee. Flaky, buttery, crunchy sugary tops. The perfect breakfast. Even if you don’t like scones! Updated September 21/16, originally posted August 22/14. Easy to make, light and fluffy blueberry chocolate chip scones sprinkled with coarse sugar - the perfect breakfast treat! Preheat the oven to 400 degrees F. Line a baking pan with parchment paper or a silicone baking mat. In a large bowl, mix together the flour, sugar, baking powder, cinnamon and salt. Grate the butter (or cut it in with a pastry blender) into the dry ingredients and stir together to incorporate the butter. Stir in the blueberries and chocolate chips. In a small bowl, whisk together the buttermilk, egg and vanilla. Pour this mixture over the dry ingredients and stir until just combined. Try not to overmix. Lightly flour your hands and dump the dough onto the prepared baking sheet. Lightly press the dough together into an eight inch circle and slice it into 8 wedges. Sprinkle the coarse sugar on top of the scones. Bake for 20-25 minutes or until golden brown. Serve warm, or allow to cool completely and store in an airtight container. They are best the day they’re made, but are good for at least 3 days after making them. They will also freeze well. I LOVE scones! But not the dry, blah kind. And I totally agree...I think most people have never had a truly good scone. If so, I'm a firm believer that everyone would love them! 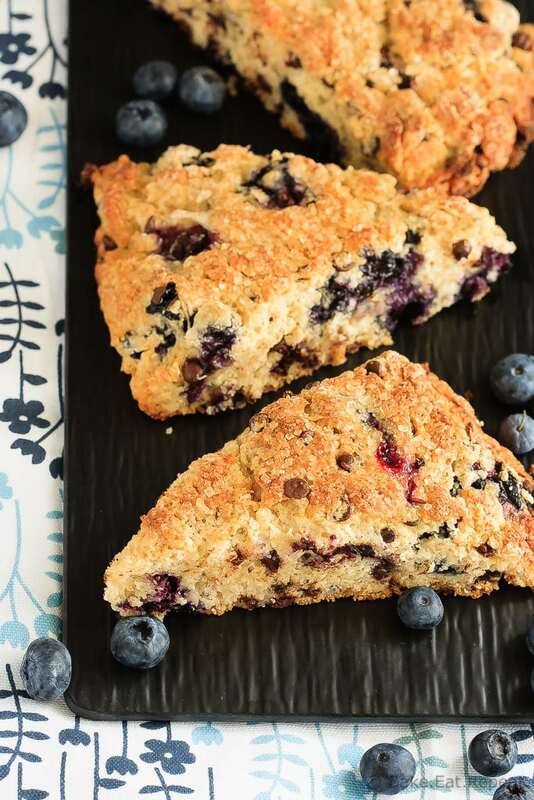 These blueberry chocolate chip scones look SO good, Stacey! What a perfect breakfast or dessert! Ok, so I think you are right. The reason I always say I don't like scones is because I've never had a good one. Will have to give this one a spin, for sure. It looks too good to pass up!